First of all, thanks everyone for the birthday wishes. I had a fabulous birthday weekend. 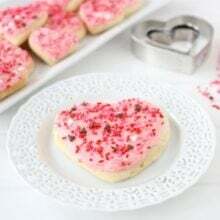 I have an easy and festive Valentine’s Day cookie recipe for you today. I made Red Velvet Cheesecake Cookies during Christmas time and they were a huge hit. Everyone loved them. 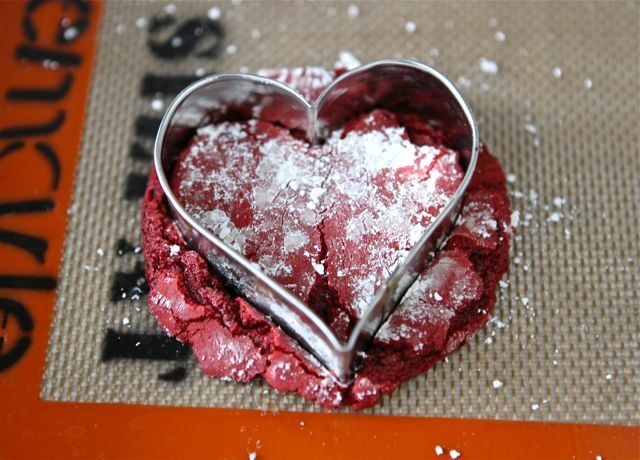 I decided I needed to create a new red velvet cookie for Valentine’s Day, red velvet is too perfect for this holiday. I made Red Velvet Crinkle Cookies and cut them into cute little heart shapes. If you are still pondering what to do for your sweetheart on Valentine’s Day, ponder no more. 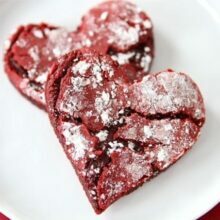 Make them a batch of Red Velvet Crinkle Cookies-their heart will go pitter patter for these cookies. These cookies are easy peasy. I used a Red Velvet cake mix to make the cookie dough. I usually make my cookies from scratch, but I had such good luck with the Red Velvet Cheesecake Cookies, I decided to use a cake mix again. I rolled the cookies in powdered sugar to give them the crinkle affect. 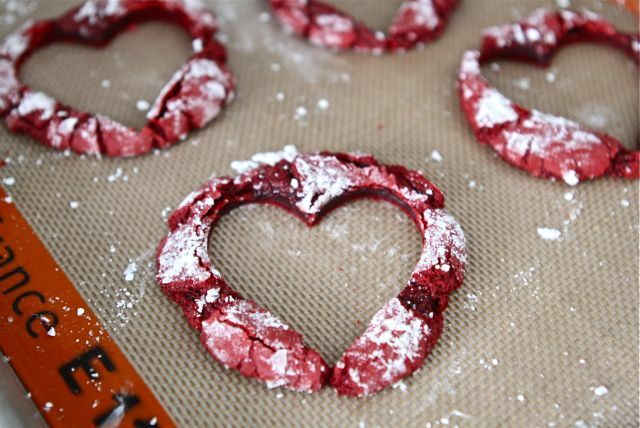 Red Velvet Crinkle Cookies cut into heart shapes for Valentine's Day. Your sweetheart will love these festive cookies. Preheat oven to 350 degrees F. Line a large baking sheet with parchment paper or a Silpat and set aside. In a large bowl, combine cake mix and flour. Whisk until clumps disappear. In the bowl of a stand mixer, mix together cake mix, flour, eggs, oil and vanilla extract. Mix until smooth. Take about 1 tablespoon of cookie dough and form into a ball. Roll the ball in powdered sugar until fully coated. Place cookie dough balls on prepared baking sheet. Bake for 10 minutes, or until edges are set and cookies begin to crack. Note-you don't have to cut the cookies into heart shapes. They are great round too! These are adorable! I love that you cut them into hearts. Love your cookies Maria!!! And I will take those cookie scraps off your hands!!! I am so in love with this idea!! The cookies are beautiful and sound amazing!! I love that these are heart shaped. Too cute!! oh my perfect! Thanks for the links to the others… I’ll do some hopping! These are awesome! That red velvet cake mix is honestly one of the best mixes out there, so I think it makes perfect sense to use it for recipes like this. These are adorable, what a great idea to make little cutouts…love it! These are nothing short of adorable. These look so sweet! I would definitely enjoy eating the scraps! These cookies look adorable and delicious…perfect for Valentine’s Day. I cannot wait to try them! Oh, those cookies are so cute! A wonderful Valentine’s Day treat. These are adorable! Red Velvet is my favorite! Perfect little sweet Valentine’s Day! Look forward to checking out the others as well. so cute!! I might have to make these to give out to my co-workers! They are so cute! I bet they’re delicious too. I am ALL about the cookie scraps. And these heart-shaped crinkles are ADORABLE!!! I’m a little in love with them, Maria! Oops, lol! I cannot wait to try these!!! Oh my goodness, these look so cute!!! These are beautiful Maria! What a great idea for Valentine’s Day. The kids would love to make these and cut them out. What size is the cookie cutter? I used a 2.5 inch heart cookie cutter. Love these! They are absolutely perfect for Valentine’s Day! I LOVE THESE!! So totally creative! These look amazing!! Easy and delicious, a perfect match! Too. Stinking. Cute. I’m loving all the red velvet recipes today! Beautiful looking cookies my dear!! nothing really beats an edible red heart! omigosh, i loooooove these! they are so so soooo cute 🙂 i would be a happy camper chilling with all of those cookie scraps! We are red velvet sisters today!! Love it! these are the most adorable cookies EVER. I keep meaning to make chocolate crinkle cookies, but these sound so much better. Everyone’s red velvet creations look drool-worthy and so festive and I want all of them! These look so adorable. I can’t wait to try them out. Love how you cut them into hearts AFTER baking! It gives a much sharper , 90 degree edge, and a more brownie, or bar-cookie-like look! I’ve got a thing for crinkle cookies too, so these REALLY have got my sweet-tooth cravings going! These are just so adorable! With the milk bottle… I feel like I can taste them right now. ABSOLUTELY DARLING! What a brilliant idea – cut the shapes while the cookies are still warm ~ Your Valentine is a lucky guy! I would honestly eat red velvet anything…but these are way cute and super sweet! These hearts are incredibly gorgeous! So cute Maria! My kids would loove these! 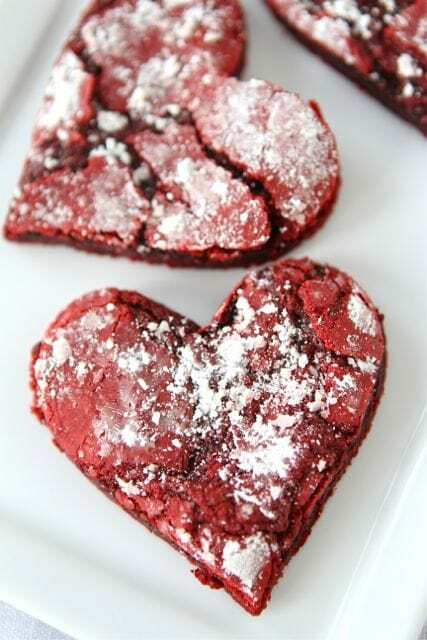 Given that I am an eternal lover of all things red velvet…I need these in my V-Day! Your cookies are always the best! You really are the cookie queen! I trust all of your recipes. Can’t wait to try these next! Love how you coated them with powdered sugar to make crinkle cookies. I know these were so good with MILK! These are beautiful and look soooo delicious. 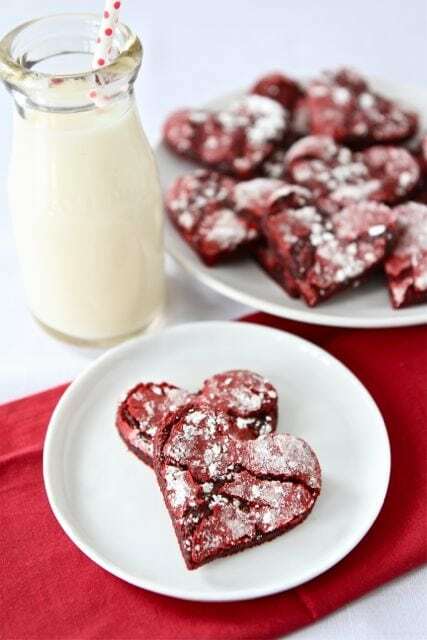 I would love to make these cookies for my sweetheart, but no Red Velvelt Cake Mix here in good old Germany… Maybe I improvise with a recipe from scratch, but if it will result in the same nice cracking effect..? 🙁 Anyway, thanks for the great inspiration! These look amazing, I am making them this week! I’m making these for sure! They look delicious! These look great and I think I will make them this weekend! 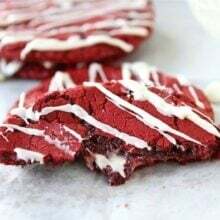 I still have a few boxes of red velvet cake mix left from the holidays when I made the red velvet cheesecake cookies – I just have to tell you that those were to die for!!!!!! Raves from everyone! thank you so much for sharing! Love your blog! These couldn’t be cuter if they tried! So simple and perfect for Valentines Day. These are adorable!! I love using cake mix to make cookies, it’s my new thing! 🙂 I’m going to try these for V-day! So you are the creator of these magical cookies I have seen all over Pinterest – no surprise! Love these!!! These cookies look so good. 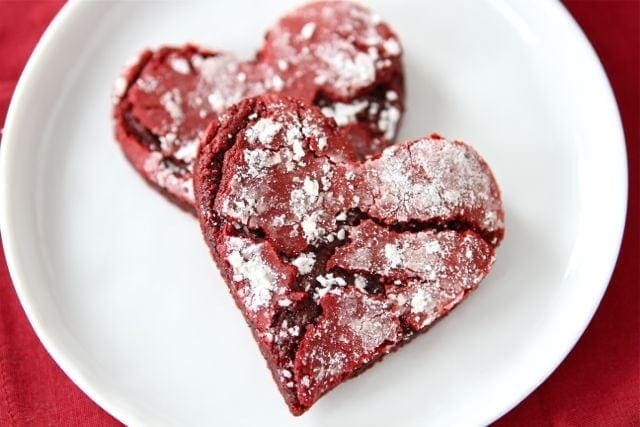 I am dying over all of the red velvet recipes I’m seeing lately due to Valentine’s Day. oh these look so GREAT!!! Very cute cookies, Maria! I’ll bet that Josh loves (mostly because they’re made by you). I love that lead shot. These cookies are beautiful, Maria! I usually don’t use boxed cake mixes either but sometimes they trump everything, like in Knock You Naked brownies. From scratch is usually the way to go but NOT always! Hi, These look so cute and yummy. Do you have a recipe from scratch for these cookies. We don’t have a Red Velvet Cake mix here in New Zealand. So cute. And I do not doubt, absolutely delicious. My friend brought these to our Bunco group last night and shared the link today. Absolutely delicious! I store them at room temperature in an air tight container. They are good for a couple of days. I made these last night. I sent some home with my son to share with his roommates and I am mailing the rest to my daughter. College kids need cute, tasty cookies and these totally fit the bill! So after finally picking up my Duncan Hines red velvet cake mix, I noticed there is a recipe for cookies on the box, but it has differnt ingredients than yours. Theirs uses the mix, 6tbsp butter, 1cup powdered sugar, 1tsp cornstarch, 2 large eggs and 1tsp lemon zest. And bakes at 375. Think I will try it both ways plus with a from scratch recipe. Thanks once again for the inspiration, I don’t think I would have gotten around to it without the pictures which made it impossible to resist. Just made these. They are both delicious and beautiful. Thank you for sharing! Thanks so much for sharing this! They are beautiful. I tried them out but with pink strawberry cake mix, so easy, yet delicious!! I will have to try strawberry next time! I made these tonight for my dance company rehearsal and everyone LOVED them. The only bummer I had was that they turned out pretty small after I cookie cut them. I supposed next time I’ll make a few less and make bigger cookies but they were delicious! Oh my gosh ! My daughter and I made these last night. I have to tell you these cookies are delicious. Sinful………She made a little box for her boyfriend and I for my husband. We kept some round an made some hearts. It was funny because we had a little bit bigger heart cookies cutter than the cookie so we experimented. You all might cringe, but we smashed the cookie a little when it came out of the oven with the spatula to fit the cookies cutter and let it cool. We taste tested to see if we they we too flat, but they were just fine. I love these cookies. I’m gonna make another box just because. I am glad you enjoyed the cookies! Maria -planning to make these tonight. am guessing they wouldn’t get the crinkle effect if we rolled them out and used the cookie cutter pre-baking right? Rolling the dough balls in powdered sugar gives them the crinkled look. i just made them! mine look nothing like the picture! lol… a lot of the powdered sugar melts when baked and mine were a lot thicker than the picture and it was difficult to get any into perfect hearts with my cookie cutter… but i’m happy they still taste good… thanks for the recipe! I just opened my box of red velvet mix and I’m worried there isn’t enough mix! Apparently in Canada we don’t like red velvet cake and the only mix I could find was for 12 cupcakes from Betty Crocker, no other stores had any and the box had “New!” on it so I’m lucky I found any at all! I’ve made cake from mix before and the bag of mix was much larger..
Do you know how much mix you had?! The Duncan Hines box mix I used makes 24 cupcakes. Just made these. Used a medium cookie scoop from Pampered Chef. They were too small for my heart cookie cutter from Michael’s, so I pulled out my mini cookie cutters from Williams Sonoma, and I got 4-5 hearts out of each cookie. They are a little bigger than Goldfish crackers. I bake all of the time, and people are always raving about what I make (toot, toot), but I hardly enjoy anything. LOVE these, top 3 favorite cookies of all time. AMAZING! So glad you liked the cookies! Yay! I am impatient and tried to make these anyways…currently I have 4 cake globs in the oven. They are impossible to roll and the rest of the mix is still in the bowl. I am waiting to see how these turn out before carrying on. Yikes! Fantastic. I’ll be baking these tonight! Just made these, they turned out great! Used a few different sized heart cookie cutters and put into cupcake wrappers. Thanks for sharing, greatly appreciate it! While I love the red velvet idea, I want to make these with what I have in stock at home…can we use any flavor cake mix (i.e. devil’s food)? Yes, you can use a different flavor of cake mix. Made these for everyone at work on Valentine’s Day and they were very yummy. Made these last night and they came out fabulous. The powdered sugar is kind of sticky, but its not an issue, just weird and annoying to my perfectionist tendancies. Just saw pink lemonade cake mix and frosting at Walmart Monday night….think they would be fabulous with this recipe for a summer partry. Frosting would be good on the cookies too! Glad you liked them! I made these for Valentine’s Day and went really light on the powdered sugar and I made cream cheese frosting. I have one of these dish/bowl combos where there’s a small bowl in the middle of a big dish. I put the cream cheese frosting in the middle and the cookies around it so you can dip the cookies in it. It’s absolutely FANTASTIC! I love it!! My husband said I was the queen of desserts!! hey i love your recipes! do you mind if i steal some of them for my blog?? Thanks! Glad you liked the cookies! Hey! I made these for my mothers birthday, used a heart cookie cutter and all. But I also made a vanilla buttercream with a splash of almond, and made its consistency stiffer than usual to create a cookie whoopie pie! I also dyed the buttercream blue, my moms favorite color, and it turned out adorable! She loved them.^.^ thank you so much for the recipe! My niece made these and they were amazing! Glad I re-connected with your blog. Keep up the good work. 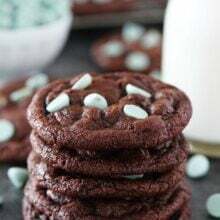 Pingback: Red Velvet Crinkle Cookies | Who needs a diet? How many does 1 box make ? It depends on what size cookie cutter you use. I used a medium heart cutter and got about 2 dozen cookies. Do you mix the cake mix with the ingredients required on the box first or do you just use the ingredients from the recipe on your site? Just use the ingredients listed in our recipe. I just made these and they are DELISH! Thank goodness I had dinner beforehand or I would end up downing the entire batch. I am on the hunt for heart shaped cookie cutters for the 14th. Thank you so much for this recipe! Could you add white chocolate chips to these? Hi, I just made the batter and its too sticky to roll into balls it just sticks to my hands. I did what you said to do. Only thing different is I used betty Crocker mix instead.I’m either going to just plop them on the baking sheet and sprinkle powdered sugar on them or turn it into cake maybe. I don’t know what to do with it. Is there a big difference between using Canola Oil and Vegetable Oil in this recipe? Will it provide a different outcome? Sorry for the really silly question, just can’t seem to figure this out. Do you only use the cake mix powder or do you prepare the cake mix (with all the wet ingredients at the back of the box) and then use it? Use the box cake mix and then follow our recipe instructions. Hi! LOVE these cookies! I made a batch last night! I was wondering, though, could I replace the oil with sour cream? Or yogurt? I haven’t tried it. You might want to start by replacing half of the oil and see how they turn out. Let me know! I’ve made heart cut out chocolate cookies before and the scraps were called the “broken hearts”. 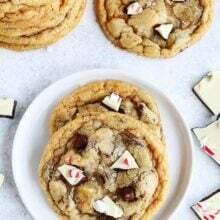 I am going to try this baking them in the pan cookie version and it would save time in scooping individual cookies before baking. Do you need to refrigerate the dough before rolling? I know with the original crinkle recipe it calls for it but where you used cake mix, I wasn’t sure how different it was from the other. Do you have any experience freezing these? Do you advise against it or any reason? Thank you for sharing this great idea .. so cute and sounds yummy and the little milk bottle is so cute .. where can I get those? perfect size for little hands. My dough was extremely sticky and very hard to form. Any suggestions? Just made these with my son. They are super cute and tasty! At first I thought the dough was too sticky but I was able to make them into a ball shape once the powdered sugar was added. Thanks for the great Valentine’s recipe. These are adorable! I think I will make these but I’d like to replace the canola oil with virgin coconut oil. Hope they turn out as nice as yours! I just made these and they taste oily. 🙁 I used my kitchen aid to mix it well too. I’m not sure what I did wrong. I think I’m in love with these cookies too! Thank you soooo much for sharing !! Hopefully will try them on mother’s day, since I missed them for Valentine’s! *On Directions, no.2, do we use 2 different bowls? If yes, how much cake mix/flour in each bowl? Yes, whisk the mix and flour together in a bowl before you add it to the stand mixer. Olive oil has a slight flavor, but you can use it if that’s all you have. I want to make these, but am a little confused. If you roll them into balls and cook them, how do you use the heart-shaped cookie cutters? Do you flatten the cookies when they come out of the oven and then use the cookie cutter or do you use the cookie cutter before you put them in the oven? I cut them into the hearts when they come out of the oven. Use the cookie cutter when they are still warm and they will cut easily. I am thinking of making these for a Drum Corps so I would need ALOT of them. Do you think they would freeze well? I’m obviously daft… but after you roll the balls of dough in powdered sugar do you leave them as balls when you put them into the oven and they flatten as they bake? These are so easy and delicious. I didn’t have access to an electric mixer, cookie cutter, or powdered sugar when I made them. They still turned out excellent. I was a little nervous these wouldn’t be that good honestly because they were so simple. I’m glad I tried them!! Definitely keeping this one pinned! I made them & they were so delicious! Mine didn’t flatten while they were baking so I wasn’t able to use a cookie cutter, but they were still so pretty. I used them for Valentines & Chinese New Years gifts. Made exactly as described and they’re perfect! can the dough be cut into hearts then bake? or with the shape not hold? My family loves these! I make them with Devils Food and Yellow cake mixes too. They are all delicious but these are definitely our favorites!! I’ve only been able to find red velvet cake mix in the 15.25 size. How would If affect the recipe if I use this instead? This is the only size I’ve seen for any cake mix flavor, not just red velvet. Is the dough supposed to be so sticky? Does the dough need to be refridgerated for awhile before rolling into a ball? several friends said to check your site out had lots of special recipes and ideas that i might like!